Hanson Pipe & Precast's eight Texas concrete pipe facilities were certified under the American Concrete Pipe Association-administered QCast [Quality Cast] program, which entails a 124-point, externally audited inspection to ensure the quality of concrete pipe products. ACPA President Matt Childs affirms, All of Hanson Pipe & Precast's Texas facilities have passed QCast Certification with high scores across the board, demonstrating a commitment to quality production by Hanson throughout the state. The QCast program covers inspection of materials, finished products and handling/storage procedures, as well as performance testing and quality control documentation. The Texas facilities are located in Austin; Grand Prairie (near Dallas); Helmers and Jersey Village (near Houston); La Feria (near McAllen); Longview; Robstown (near Corpus Christi); and Waco. Separately, Hanson Pressure Pipe's Hattiesburg, Miss., facility achieved two years without a lost-time accident and one year without a recordable incident. Observes Hattiesburg plant manager Kevin Baas, Safety has always been a top priority, but it is important to refocus on safety basics and find ways to improve. A safe plant cannot be maintained by slogans and posters: it takes a commitment from each employee at every level. Accordingly, the Hattiesburg facility holds weekly safety meetings within each division and work group. Plantwide, quarterly safety gatherings emphasize key safety concerns and achievements. In addition, luncheons with prizes and awards for safety milestones and top safety suggestions encourage employees to continue best safety practices, company officials affirm. Internal improvements to reflect changing market dynamics include company realignment on key building-, transportation- and infrastructure-related business segments, leading to Spancrete Group's three leadership appointments: Formerly a regional sales manager at Spancrete's Illinois office, Jim Clapper has been promoted to vice president of Precast Sales, responsible for expanding the Midwest market share. 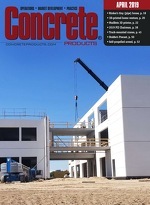 He has more than 25 years of concrete sales experience, including six years with Spancrete. Bringing 30-plus years' experience to his new role, J.P. Nolan has been named vice president of Transportation and Infrastructure, responsible for leading business operations and expanding market opportunities within the transportation and infrastructure business unit. Additionally, he will continue to serve as vice president of Spancrete Group subsidiary American Concrete Pipe Co. (note separate report, pages 22-23). Scott Bertschinger has been promoted from corporate safety director to corporate director of human resources and risk management. In addition to more than 10 years of Spancrete service, he brings to his expanded role SPHR [Senior Professional in Human Resources] certification, encompassing six functional areas, including strategic management, workforce planning and employment, and human resources development. Separately, Paul Kero has been named vice president of Spancrete Machinery Corp. to oversee its business operations, including new global strategy development, new market segment identification, and serving the needs of existing Spancrete providers. He previously served in senior management roles for Cherry Corp., Beltone Electronics Corp., Motorola Cellular, Northern Telecom and Illinois Tube Co. Concrete Industry Management (CIM) National Steering Committee and patron groups are soliciting donations of equipment, material, and other marketables for a sixth annual auction, to be staged January 20 at the 2011 World of Concrete in Las Vegas. Proceeds will benefit the CIM National Steering Committee and support CIM programs [at Middle Tennessee State University, Arizona State University, New Jersey Institute of Technology, Texas State University, and California State University-Chico], as well as help fund future program expansion, notes CIM Auction Committee Chairman Peter Brewin. The CIM National Steering Committee raised approximately $386,000 at the February 2010 auction, bringing five-year total proceeds from silent and live bidding Û customarily on World of Concrete day three Û to $1.7 million-plus. Auction items have included cement loads, concrete saws, drills, mixers, vibrators, scaffolding, safety equipment, screeds, fiber transport systems, dust collectors, testing equipment, decorative concrete tools, water meters, pumps, generators, training sessions, reference books, advertisements, laptop computers, sports memorabilia, and, sports, golf or vacation travel packages. Manufacturers and service providers interested in making donations can contact Peter Brewin, 214/693-6669, [email protected].